Historians believe they’ve unraveled the mystery of a cryptic note Lincoln penned that doesn’t identify the recipient by name and has a section clipped out. Obama's signature - is it real or has it signed by an autopen ? WASHINGTON (AP) — It’s the open secret that nobody in government wants to talk about: That cherished presidential signature that‘s tucked away in a scrapbook or framed for all to see might never have passed under the president’s hand. On Christmas Eve, 1910, future president Warren G. Harding got out a photograph of himself, and on the back wrote an impassioned love note to his mistress. DALLAS — Files containing historic documents related to the assassination of President Kennedy were presented to Dallas County officials on Tuesday. The documents offer a new layer of understanding to the 16th president's often-overshadowed descendants, museum officials said Saturday. More than 70 documents belonging to Abraham Lincoln's family have joined the collection at the Abraham Lincoln Presidential Library and Museum, officials there said. One collector's love for presidential memorabilia lasted decades—and led to an indictment roiling a cloistered world..
At age 10, Barry Landau wrote a letter to Dwight D. Eisenhower, admiring his "very beautiful" wife and offering his assessment of where the general stood in the country's pantheon of great leaders. 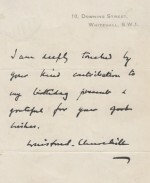 "I think you lived the most exciting and the most interesting life then [sic] any other President of our United States," according to a copy of the letter released by the Eisenhower Presidential Library and Museum. This exhibition features letters, manuscripts and signed photos that celebrate various aspects of the remarkable life and character of Ronald Reagan, the 40th U.S. President. There are examples of his optimism and his pessimism; letters about his fierce presumption of racial equality, and manuscripts decrying riots, lawlessness and a coercive state. 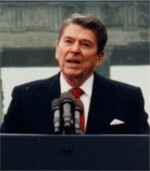 Featured, too, is a photo of Reagan at the Brandenburg Gate in Berlin inscribed “Mr. Gorbachev, Tear Down This Wall!” Present is a letter written shortly after surviving his own assassination attempt saying, typically, that he was feeling fine. Ronald Reagan led an extraordinary life: this exhibit allows us to celebrate its rich diversity.